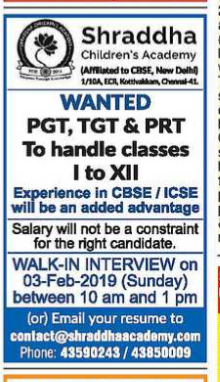 Shraddha Children's Academy,Chennai has advertised for the recruitment of Teaching Faculty- PGT,TGT,PRT jobs vacancies. Interested and eligible job aspirants are requested to walk-in on 03-01-2019 immediately.Check out further more details below. About School: Martin Luther King Jr. once said “Intelligence plus character – that is the goal of true education”. This is exactly what we at Shraddha believe in and are striving to achieve in every child in our institution. Shraddha – a CBSE school in Chennai, employs non-conventional and innovative methods of teaching including computer aided learning process, active involvement of students in activities, experiments that help them gain firsthand experience on what they come across in their books. Experience in CBSE/ICSE will be an added advantage. Salary Package:Salary will not be a constraint for right candidates. How to Apply: Walk-in interview on 03-02-2019 between 10am to 1pm.or email resume to given id.